The soap I am about to review is not well known in the shaving world, since it doesn’t have the appropriate marketing strategy, or it never had the “high” price that wakes up in us the deceiving thought of “the price is high therefore it must be of great quality” and never got the attention from the forum members and classic shaving users. However, low price soaps packed with the amount of quantity normally accomplish to surprise everyone with their hidden qualities making their ratio quality/durability/price excellent. The Haslinger soaps are manufactured in Austria and according to their web page and soaps descriptions, they are made with 100% natural products and they only use a few which make them simple and efficient. I have to say that the name of some of the ingredients are quite very weird which make me believe they are not so 100% natural. But who am I to criticize if I am not a chemist? 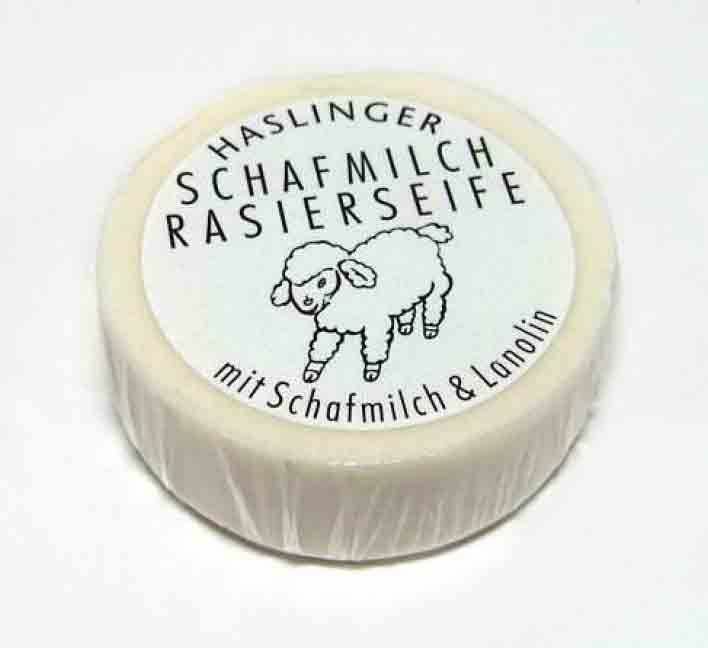 The soap under review here is the Hasslinger Honey o “Honig” in German I believe. I had a lot of fun reviewing this “punchy” soap, it is a good fighter which can bring very fun shavings. This soap main characteristic is its simplicity. Therefore, its presentation is also quite simple. It comes in two different formats, one as a simple puck wrapped in plastic with its label and the second one, the same puck but in a minimalistic plastic container, just simple plastic. It is called “extreme simplicity”. The soap in the plastic container cost one extra euro than the normal puck. The one I review here came in this extra cheap and small plastic bowl that to me is useless. If you are a fussy or pernickety persona and want to keep your soaps well labeled in your drawers, then you will have to remove the sticker from the soap puck and stick it in the plastic container. However, just to let you know that the label is also quite clumsy and it dissolves quite quickly with the water touch. The ingredients are quite simple and basic, and the formula doesn’t include too many. Tallow is the one that stands out from the rest (I just love Tallow). In my humble opinion, since I am not a chemist, this soap has a high Tallow concentration in the mix since a thick and spongy and fluffy lather is produced when we soap this Haslinger. Glycerin is another ingredient in high doses since the glide of the soap is quite excellent. It is a soft soap, it can be easily moldable with the fingers. The soap puck weights 60 grams, which is small for my liking but it is perfect for travelling and to save space in our bathroom cabinets or drawers, it doesn’t take any space at all. This format will allows any one of us to finish the soap in a relative quick time which enlightens my day since after 2 years in this I haven’t been able to finish a single soap. If we use it daily, my educates assumption is that it will last between one and one month and a half. Due to the soft nature of the soap, loading the brush is a quick task and we don’t need to rub long periods of time to get a decent soap load. I shave my face and my head, therefore everytime I load I need a good bunch of soap not to run out of lather at the end of the shave. Therefore, to maximize loading activity, I use the WET BRUSH technique which bestows the possibility to load massive amounts of soap. Due to the small size of the soap puck, it has to be held in the hand to load directly from it. This makes this operation quite annoying since the soap will get slippery with the water and it will move all around the hand or it might fall in the ground. I recommend to place a bowl underneath the hand, so the foamy lather is generating by the pounding of the brush over the soap falls in it and it doesn’t go to waste. We can smear our face or bold head with it. One of the best characteristics of this soap is that it lathers easily and abundantly. It needs quite a bit of water since the tallow consumes it quickly. However, I recommend to add 8-10 drops of water at a time and not strings of water, it might ruin the lather. I was greatly surprise with the lather quality of this soap talking into account its inexpensive price. It is very abundant, which we all like, it is quilted and if it is well hydrated then it is also very flexible and sliding. The lather has a yellowish color which gives us the sensation of having honey in our hands and it gives out a nice sweet honey smell, intense but not overpowering. It is quite easy to apply the lather over the face, it sticks quite nicely to the skin. Due to its flexibility and sponginess, we can spread it across the face quite homogeneously. Its sliding and protection qualities are worth mentioning. They are quite decent due to the high concentration of Tallow and Glycerin. Personally, Tallow is an element that treats my skin quite delightfully (to other might be the contrary). Tallow provides that extra “oily” cover that helps the blade to slide smoothly and it also protects the skin. I will probably not say anything new in this department. The post is excellent, I would say. The tallow provides that softness we are looking for after the shave. If after each pass, we used the remaining lather in our face, we don’t rub it with a towel, and we spread it all over the face till it is absorbs by the skin, we will obtain an extra layer of protection which will provide an even best post. The honey scent is well accomplished. We can detect there is honey in the soap, but its smell is not tiring and too strong, it is well balanced. The aroma remains intact during the entire shaving process giving us sweet moments during this time. Summarizing, it is a very delightful and natural scent. The price of just the soap puck is 5.95€ and 6.95€ with the plastic container. It is a very reasonable price making its quality/duration/price ratio a great buy. My recommendation is to have this soap in our rotations since it will five very pleasant shaves for penny. Great review, really detailed more like this please. More are coming your way. But they take my time since I tend to write all the details I found during my findings. Agreed- this was a very well thought out and comprehensive review. Thanks for taking the time and sharing natmizer . Nice job on the review. I plan to try this affordable soap some day. I wouldn't say Haslinger isn't well known in the wet shaving world though because I can't tell you how many times I hear people rate it the best or their favorite low price soap. It's fairly easy to find too. Maggard Razors carries it in a lot of different scents, perhaps all, and Gifts and Care carries it as well. TVB and Shavemac are the cheapest places to get Haslinger if you are willing to bring a few pucks in. When I bring them in, they can be as low as $4.50/puck, landed in Canada. The best soap on the market, at least for me. I love everything about them. An excellent review! Thank you. (01-31-2016, 01:19 AM)Bruce Wrote: TVB and Shavemac are the cheapest places to get Haslinger if you are willing to bring a few pucks in. When I bring them in, they can be as low as $4.50/puck, landed in Canada. Yep that's where I got mine. What's your favorite scent of their's @Bruce? Have you tried them all?